Who doesn’t love taking on new adventures when they travel? Especially when these new adventures pop up in vacation destinations that they know, love, and are always looking for something new? 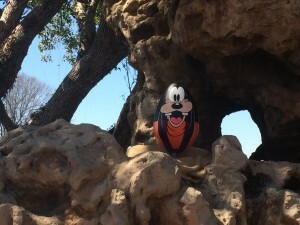 A relatively new offering in the Disney Parks entertainment lineup is the Eggstravanganza, an annual hide-and-seek game where Cast Members place large themed Easter Eggs at various points in designated parks, and guests seek them out during their visit. The game is easy enough to play and any park guest can do so free of charge as the eggs are all “hidden” on-stage throughout the host park. You may recall that we featured a similar adventure when we looked at Remy’s Hide and Squeak, which takes place in the fall during the Epcot International Food and Wine Festival. If you wish to get a little more competitive, you can buy a map for $5.95 plus tax (there is no annual pass discount). 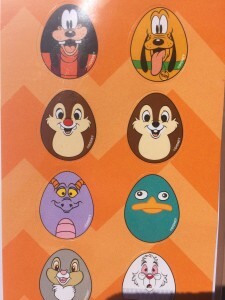 In this version of the game you place the sticker for each character egg on the location where you found the corresponding egg in the park and you receive a “prize.” For this game you can choose between 7 plastic Easter Eggs (or, as we saw, one guest bought 7 maps to get all 7 prizes). 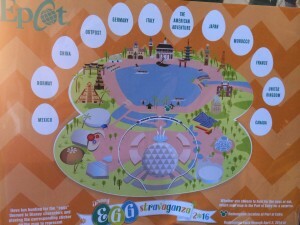 The Eggstravanganza takes place in 4 locations in the U.S. parks. California visitors get 3 opportunities to play, as separate games take place in Disneyland Park, California Adventure, and Downtown Disney. Walt Disney World offers only one game to its visitors, however it does take place in the ideal setting of Epcot’s World Showcase, so it scores big points for the location. This is the game that Candace and I recently played. 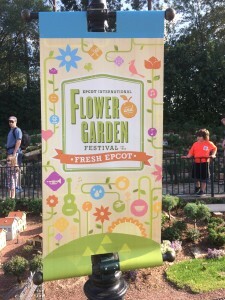 The Epcot version of the game features 12 eggs hidden in each of the 11 World Showcase countries and the Outpost. The eggs are beautifully decorated and depict the following Disney characters: Mickey Mouse, Minnie Mouse, Chip, Dale, Donald Duck, Figment, White Rabbit, Thumper, Daisy Duck, Perry, Goofy, and Pluto. The premise of the game is simple enough: you walk around the park as you would normally, and you and your travel buddies look for the eggs, some of which are hidden in plain site, and others that are deceptively located among the intricate themeing of Disney’s various lands. We loved this game. Ok, we love strolling through Epcot’s World Showcase on a “normal” day, and love it even moreso when the Flower and Garden Festival is in full bloom (pun groan!) 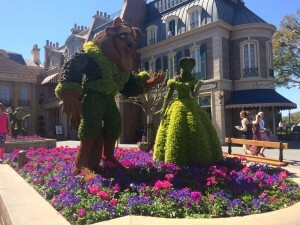 as the topiaries and other seasonal displays are gorgeous and fill the air with amazing aromas. Whether you choose to buy a map or not, this hunt adds a little something extra special and fun to your day in the parks and we would highly recommend trying it out. We offer two warnings: First, some of the eggs are very trickily hidden (even moreso that Remy’s Hide and Squeak), and you will find yourself determined to not move onto another location until you find them all. Second, you and your travel buddy will soon find yourselves VERY competitive to find the eggs first. Candace and I completed the challenge early on during our recent trip, and then a few days later met up with some friends who also wanted to check it out. At first our friends were nonchalant about it all, but quickly grew more eager to find all of the eggs on their own. Needless to say, it was a lot of fun and is deceptively addicting. 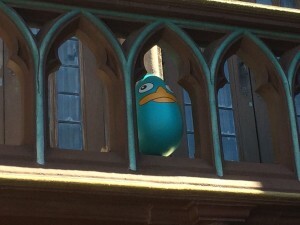 Additionally, for at least one location in the Epcot version of the game, one of the eggs was relocated within the same country by cast members between our visits. We do not know how often Disney relocates eggs, however doing so makes the game more repeatable if you are making multiple visits throughout the holiday season. We do suspect that, given the hiding spots of several of the eggs, that they will not be moved (this should be a hint to you that some of the hiding spots are difficult to find!). Some of the spots are easy to find, others are more challenging. You just need to pack your spirit of adventure, and, if you get stuck, you can always ask a Cast Member or fellow park guest for help. And yes, it is very obvious which guests are actively engaged in the adventure. This limited-time offering is definitely worth making time for your Disney trip during the pre-Easter season. In fact, we would love to see Disney roll out more of these adventures and games in the parks and rotate them seasonally as they are easy, fun additions to a day in the Disney Parks. The best aspect of this game is that, unlike the interactive games like Agent P’s Adventure, you can easily incorporate the game play into your normal park touring plan and you get to go wherever you want in the parks at your own pace, without being told where to go and when to go there. This game just goes to show that, even in small and simple ways, adventure is indeed out there! Good luck and happy Easter Egg hunting!